There are some films that just don't need a follow up and these ones are usually the films that get a less than adequate sequel. The Trip was not one of these films. It was the type of film that begged for another as you just couldn't get enough of it's two leading men, Steve Coogan and Rob Brydon. The Trip To Italy is a wonderfully pleasing sequel that gives fans more of what they loved about the first film. The two friends may have changed in the past few years which in turn means the tone of the film differs slightly from the first, but there is plenty to love about The Trip to Italy including some fine cuisine and beautiful Italian landscape. After 2010's trip of northern England, Steve Coogan and Rob Brydon are reunited to once again experience six culinary delights, but this time they are on a trip of Italy. The two travel through the country and while dining at some of the best restaurants Italy has to offer, they discuss their lives and how things have changed since the first trip they took. However, their conversations are not all entirely deep and meaningful with there being plenty of comedic moments and no lack of impersonations. What made The Trip successful is what makes The Trip to Italy successful, yet there are some elements which make it even more so. While the two actors play themselves, the screenplay is ultimately fictional and the dialogue brilliantly improvised. As one could expect from two comic actors such as Coogan and Brydon, the dialogue is extremely amusing and funny. Whilst on their Italian culinary road trip, the two have several memorable conversations including, but are not limited to Alanis Morrisette's album, "Jagged Little Pill" which is their soundtrack of choice and poet's Byron and Shelley. The impersonations both Coogan and Brydon do throughout the film are just superb. Once again Michael Caine makes an appearance and other notable impersonations are of The Dark Knight Rises and The Godfather casts. The Trip to Italy isn't your typical sequel and doesn't entirely feel as though it should be given the tag of being a sequel, yet it is a very welcome one. The large majority of sequels these days come from blockbusters which bring in the big dollars at the box office. Both The Trip and the Trip to Italy are films which are largely based on conversation and comedy and are unconventional in their storytelling. 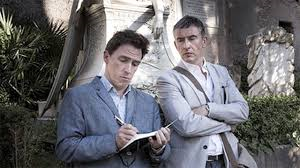 The chemistry between Coogan and Brydon and the brand of comedy they brought to the screen in The Trip was so brilliant that it is a real treat to see all this again in The Trip to Italy. There are some features of the first film which have been resurrected and expanded upon for the second film (eg. the Michael Caine impersonations) and ultimately the two are very similar films. However, The Trip to Italy is perhaps a little more of an emotional journey for the two leading men and takes on a greater back story than the first. While this is a good thing as it adds more to the storytelling aspect of the film and makes the characters more relatable, it doesn't give an ongoing commitment to this new depth and the ending leaves the audience feeling as if they should know more. The aesthetics of this film are enviable in the best possible way. Coogan and Brydon's trip takes them to six restaurants in some amazing locations throughout Italy. These restaurants produce some amazing cuisine which are visually incredible and it doesn't take much of an imagination to admit that the food must taste as amazing as what it looks. Next to Coogan and Brydon the third star of the film is indeed Italy. The panoramic shots of the Italian countryside and seaside are exquisite. The shots taken in Pompeii during the daytrip there show the historical abandoned city in such an interesting and loving light. Steve Coogan and Rob Brydon have terrific chemistry on screen. The two work together so well and their amusing conversations flow wonderfully. The Trip to Italy is perhaps a tad more Brydon's film than Coogan's, as Brydon holds the majority of the comedic spotlight. Coogan's performance is more of an emotional one and in the brief emotional scenes, he does do well in them. 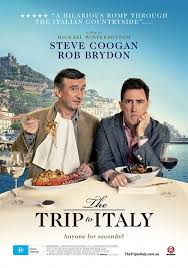 There is no denying that both Coogan and Brydon are wonderful comedy actors and both The Trip and The Trip to Italy showcase their extraordinary ability to successfully improvise some extremely funny material and make it relevant to the scenario at hand. The Trip to Italy is tremendously funny and a film so aesthetically pleasing that it is completely enviable. It is a very good follow up to the first film, but also a wonderful stand alone film.